A symbol of Western Civilization at its most magnificent, Athens boasts an illustrious history that stretches back more than 3,000 years. The city flourished during classical antiquity and was the birthplace of Socrates, Pericles, and Sophocles. More than just a relic of its glorious past, today Athens is a bustling and modern capital city. A completely different vacation experience from the idyllic Greek islands, Athens can feel hectic and crowded but compensates with amazing cultural attractions. The Acropolis is one of the world's most breathtaking ancient ruins, and the city's exceptional archaeology museums display fascinating artifacts uncovered at local sites. Other hidden charms awaiting discovery are the dazzling Byzantine churches found all over the city and the village-like neighborhoods north of the Acropolis. Tourists will enjoy getting lost in the Plaka district's narrow pedestrian streets, lined with quaint bougainvillea-draped houses and inviting restaurant terraces. Few sights in the world compare to Athens' Acropolis, with its Parthenon temple perched high on a rocky crag keeping watch over centuries of civilization. A reminder of the glory of ancient Athens, the Acropolis was the center of the ancient city and functioned as a citadel in its protected hilltop location. The most emblematic building is the Parthenon, the largest temple of the classical antiquity period dating from 447 BC to 338 BC. With its monumental rows of Doric columns and stunning sculptural details, the temple is an awe-inspiring sight. In the frieze on the eastern side, reliefs depict the birth of the goddess Athena. Other ruins of the Acropolis include the Erechtheion, a complex of ancient sanctuaries built between 421 BC and 395 BC. The most famous feature of the Erechtheion complex is the Porch of the Caryatids, with six statues of maidens in place of Doric columns. Be sure to also visit the Acropolis Museum at 15 Dionysiou Areopagitou Street, below the Acropolis hilltop. This museum contains one of the most valuable collections of ancient Greek art in the world. Also nearby are two interesting neighborhoods, Plaka and Anafiotika, charming areas to stop for a meal and stroll around the picturesque pedestrian streets. Founded in the 19th century, Athens' National Archaeological Museum is the largest archaeological museum in Greece and one of the greatest antiquities museums in the world. The museum is housed in an impressive Neoclassical building with 8,000 square meters of exhibition space. On display are five permanent collections with more than 11,000 exhibits, offering a comprehensive overview of Greek civilization from prehistory through the classical period to late antiquity. The Prehistoric Collection covers the sixth millennium BC to 1050 BC (the Neolithic, Cycladic, and Mycenaean periods) and presents findings from the prehistoric settlement at Thera. The Sculpture Collection exhibits ancient Greek sculptures from the sixth century BC to the fifth century BC, including rare masterpieces. The Vase and Decorative Objects Collection showcases ancient Greek pottery from the 11th century BC all the way until the classical Roman period. The Stathatos Collection features minor objects from a wide range of historical periods. Exquisite little statues and figurines sculpted from metals are on display in the Metallurgy Collection. This interesting museum offers fascinating insights into the Byzantine period of Greek history. Housed in a 19th-century palace originally built for the Duchesse de Plaisance, the wife of Charles-François Lebrun of France, the museum displays a precious collection of Byzantine art. The Byzantine Empire was the inheritance of the eastern half of the Roman Empire after it fell; the expansive empire was officially Orthodox Christian in religion and Greek speaking. From the third century to the 15th century, the Byzantine Empire ruled over the land of what is now the Balkans, Greece, and Asia Minor. During this time, religious art was highly valued. Byzantine artists created masterpieces of detailed, glittering mosaics and gilded icons. With more than 25,000 artifacts on display, the Byzantine Museum is a treasury of religious artifacts from the Byzantine period as well as pieces from the early Christian, medieval, and post-Byzantine eras. The collection includes sculptures, paintings, icons, textiles, and mosaics. Highlights are the architectural fragments from early Christian basilicas and Byzantine churches and the reproduction of a fountain depicted at the Monastery of Dafní. The museum's courtyard features a splendid fragment of a mosaic floor from the fifth century. 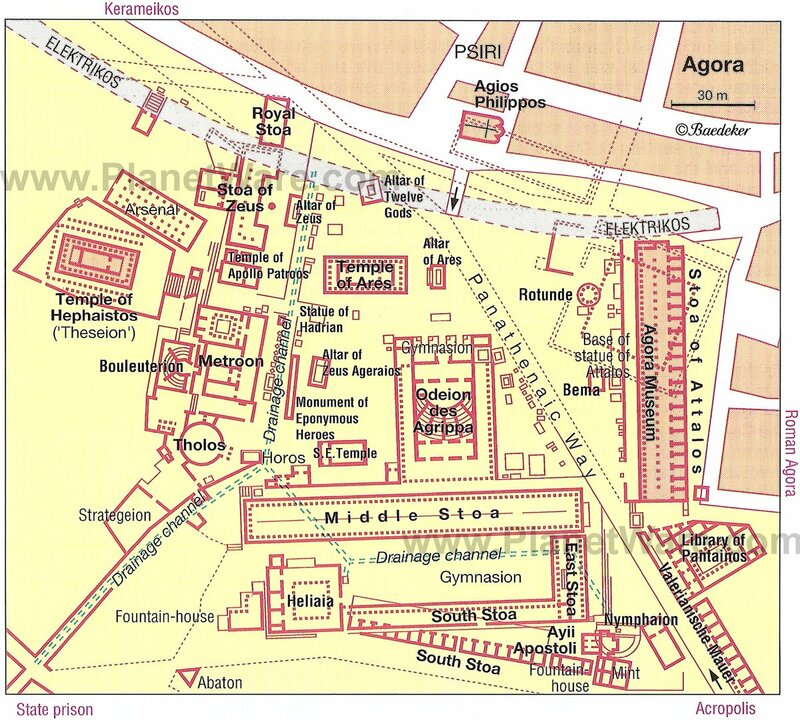 The ancient Agora was the marketplace and the center of everyday life in ancient Athens. For an impressive view of the Agora from afar, head to the north wall of the Acropolis or the roads from the Areopagus. 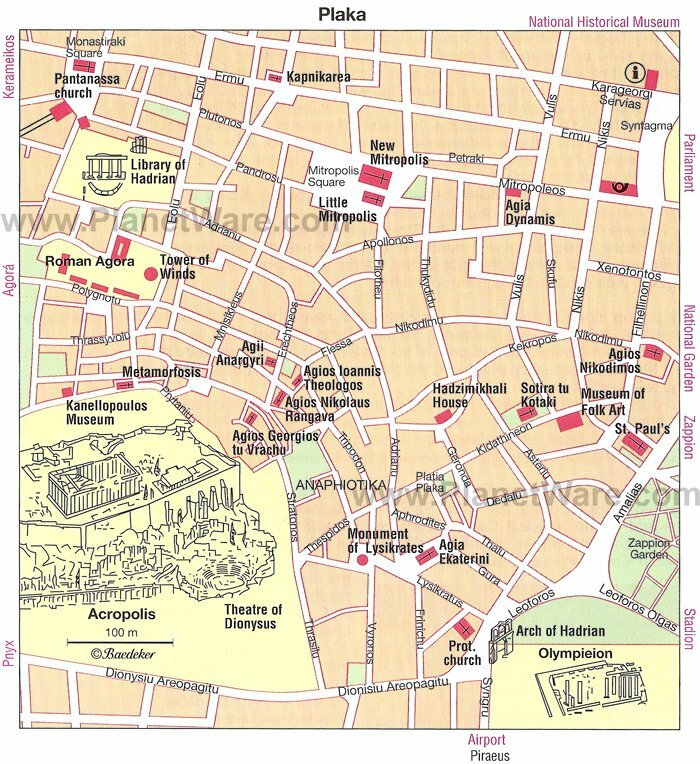 The best place to enter the Agora is at the north gate off Adrianoú Street (near the Church of Saint Philip). The Greek word "Agora" means to "gather and orate," indicating that this site was a location of public speaking. The Agora was a place of administration and commerce as well as the meeting place of the Agora tou Dimou, a civic decision-making group. Athletic events and theater performances were also held here. One particularly interesting feature of the Agora is the 18-meter-long Royal Stoa, the seat of the Archon Basileus, who took over the cultic functions of the earlier kings. This sixth-century BC stoa may have been the scene of Socrates' trial in 399 BC. From the Agora, tourists can take a pleasant walk along the footpath that leads up the Agora Hill (Kolonos Agoraios). On the hilltop at 24 Andrianou Street is an awe-inspiring sight, the Temple of Hephaistos. This fifth-century BC Doric temple is one of the best-preserved ancient Greek temples, thanks to its conversion into a Christian church, which saved it from destruction. The temple was designed on a classical plan with six rows of 13 columns, and the Ionic friezes appear to be modeled on the Parthenon. Across from the Roman Agora, only 16 meters away, is the site of the ancient Library of Hadrian, a complex of buildings founded by Emperor Hadrian after AD 132. In the Kolonáki quarter, the Museum of Cycladic Art was created in 1986 by the Nicholas and Dolly Goulandris Foundation. The shipowner Nikolas P. Goulandris was a well-known patron of the arts and cultural life in Athens. Goulandris' own collection forms the core of the museum's exhibits. Housed in a sleek modern building with a facade of marble and glass, the museum's permanent collection includes more than 3,000 objects. The collection represents ancient Greek art, ancient art of the Cyclades (the islands in the Aegean Sea encircling the Island of Delos near Mykonos), and Cypriot art (from the island of Cyprus) dating from the fourth century BC to the sixth century AD. Many of the artifacts on display date to the sixth century BC. Temporary exhibits are held at the elegant 19th-century Stathatos Mansion, accessible from the main building by a passageway from the atrium. On the site of the ancient Agora, the Church of the Holy Apostles was the only building left standing when this entire quarter of Athens was demolished to excavate the Agora archaeological site. Built in the 10th century, the church stands above a nymphaion (sacred spring). The exterior is notable for its ashlar masonry and its ornamental Kufic (a style of Arabic script) inscriptions. Typical of Byzantine architecture, the church has a dome supported on four columns, and the apse and transepts feature semicircular conches. The interior of the dome is adorned with original frescoes depicting Christ Pantocrator (Ruler of All), John the Baptist, adorable little cherubim, and archangels. Much of the original 11th-century iconostasis (wall of icons and religious paintings) has also been well preserved. Gracing a little square that opens onto Ermoú Street, the Panaghia Kapnikaréa Church is a delightful place to visit. This beautiful little church was saved from demolition in the 19th century by the intervention of King Ludwig I of Bavaria. The church is a splendid example of architecture from the 11th-century Byzantine era. During this period, domed cruciform churches such as this one were typical. In the 12th century, the church was enhanced with a graceful entrance portico and a narthex featuring four pediments (built onto the western end). Inside, the church is decorated with 19th-century paintings created in the iconographic style of the Middle Byzantine period. Dedicated to Zeus, the Olympieion was the largest temple in ancient Greece. 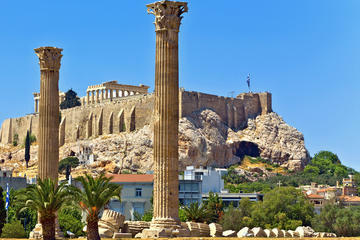 Though the Parthenon is better preserved, the Temple of Olympian Zeus was an even more monumental structure in its day. The temple dates to the sixth century BC but was not completed until the second century AD by the Emperor Hadrian. It's easy to imagine the grand impression this temple made in its complete form. More than a hundred enormous marble columns once supported the grandiose sanctuary. Only 15 columns remain standing, and another surviving column lies on the ground, but the ruins' monumental presence gives a sense of the massive size of the original building. The gigantic structure was a befitting shrine to Zeus, the ancient Greeks' most all-powerful God, known as the King of Gods. Nearby, just north of the Olympieion, is a small park containing the ruins of Themistokles' wall and the ancient Roman baths. Ancient Athens's largest building, the Panathenaic Stadium, has a capacity for 60,000 spectators. Constructed around 335 BC during the era of Herodes Atticus, the venue hosted the Panathenaic Games where runners competed in races around the track. The 204-meter-long track was designed with four double herms, where runners would turn in the races. Around AD 140, the stadium was updated with new marble seating by Herodes Atticus. The structure that tourists see today is a replica of the original stadium, which was rebuilt for the Olympic Games of 1896. This modern-era Olympic Stadium was created in the identical fashion as the Panathenaic Stadium, with 47 tiers of seating and a rounded southeast end. Between the northern slopes of the Acropolis and Ermoú Street, the picturesque Pláka neighborhood boasts two important archaeological sites on Pepopida Street: the first-century BC Roman Agora and the second-century Library of Hadrian. However, the main attraction of this historic area is its charming village ambience. Narrow pedestrian streets and the cheerful little squares of the Pláka quarter are lined with lovely bougainvillea-trimmed pastel-painted houses. Tucked away in peaceful corners of the neighborhood are historic churches, such as the Metamórfosis Church in the southwest and the Church of Kapnikaréa in the north. The picturesque setting invites leisurely strolls. The Plaka quarter has an abundance of authentic Greek restaurants with inviting terrace seating. The area is famous for its Restaurant Staircase on Mnisikleous Street. Many of the restaurants look enticing but most are tourist traps (with aggressive hosts baiting passersby to enter) and should be avoided. Consult a guidebook or ask a local for recommendations before choosing a restaurant in this area, or instead try the quieter streets hidden away on the hillside, which conceal cute little cafés and tavernas. Also nestled into the slopes north of the Acropolis is Anafiotika, another atmospheric village-like neighborhood where tourists can enjoy a traditional Greek meal. The winding medieval streets of this Anafiotika are also a delight to explore. For many tourists, watching the Changing of the Guard at Syntagma Square is an exciting and memorable experience. The Soldiers of the Presidential Guard stand in front of the Hellenic Parliament on Syntagma Square 24 hours a day, year-round. The guards wear traditional costumes complete with pleated skirts, leg tassels, and pompom shoes. The Changing of the Guards takes place in front of the Tomb of the Unknown Soldier monument at 11am daily. This monument honors anonymous soldiers who died fighting for the country. The monument features a marble relief that imitates a warrior grave stele of ancient times. In a verdant setting on Philopappou Hill, this tiny 12th-century Byzantine chapel offers tourists an enchanting spiritual experience. The chapel was built at the Diateichisma Gate because of the ancient belief that divinity protected the gates. Inside, the chapel has a single-aisle vaulted basilica form, and the walls are adorned with frescoes dating to 1732. The chapel's name "Loumbardiaris" (meaning "The Cannoneer") is connected with the legend that the church was saved by a miracle around 1650 when the Turkish commander of the Acropolis, Yusuf, bombed the church. The church was restored in the 1960s by the architect D. Pikionis. Another highlight of visiting Philopappou Hill is the chance to take in spectacular views of the Parthenon from this location. Luxury Hotels: Within walking distance from the Temple of Olympian Zeus and many good restaurants, the boutique AVA Hotel Athens offers quaint and cozy suites with kitchenettes. The O&B Athens Boutique Hotel is a 10-minute walk to the Acropolis and features modern rooms and a spectacular rooftop patio with amazing views. The elegant Grande Bretagne Hotel, with a well-regarded rooftop restaurant, is set in a prime location that it has occupied since 1874. Mid-Range Hotels: The appropriately named Plaka Hotel offers good rooms in a great location, and the rooftop patio has views to the Acropolis. Free coffee and tea are on offer all day long. The Hermes Hotel in the Plaka is newly renovated and just a two-minute walk to the attractions of Syntagma Square. On a quiet side street, the Central Hotel has also been recently renovated and offers modern, comfortable rooms and a hot breakfast. It's a 15-minute walk from the Acropolis, and the view from the rooftop patio is quite spectacular. Budget Hotels: The Hotel Acropolis House is a good value option close to all the attractions. Basic but comfortable rooms are on offer, and the shops of the pedestrian-only Ermou Street are a short stroll away. The Kimon Athens Hotel features small but well-appointed rooms and is a two-minute walk from Syntagma Square. The Hotel Metropolis has been recently renovated and provides rooms with balconies, some facing the Acropolis. See the Sights: For maximum sightseeing flexibility and value, it's hard to beat the City Sightseeing Athens Hop-On Hop-Off Tour. Accompanied by an audio commentary, you can cruise around Athens in an open-top double decker bus, hopping on and off at any of the 14 stops to spend more time at your favorite attractions, such as the Acropolis or the Plaka. If you only have a few hours to see the highlights of Athens, the Athens Half-Day Sightseeing Tour blends both the city's ancient and modern attractions. 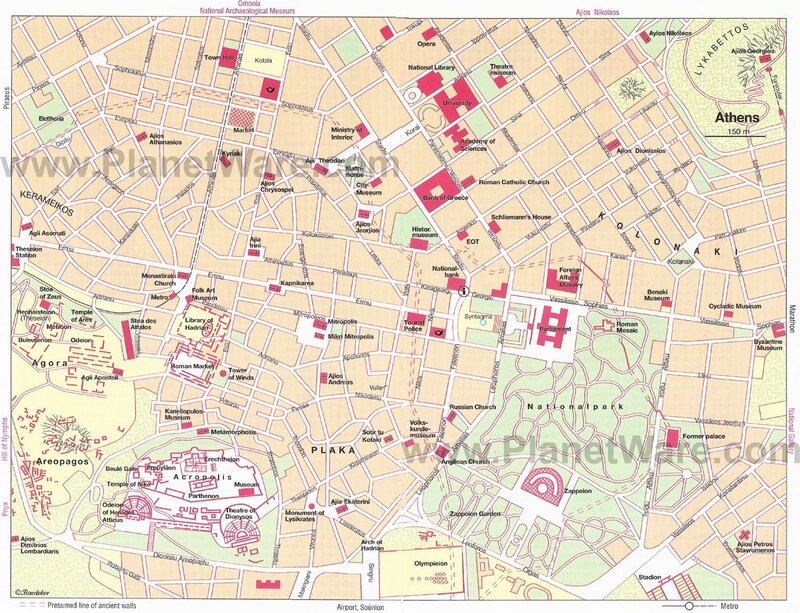 An expert guide takes you to see top sites such as the Tomb of the Unknown, the Acropolis, and the Pantheon. This 3.5-hour tour includes admission to the Acropolis of Athens and the Acropolis Museum (optional), hotel pickup, and free Wi-Fi on the coach. 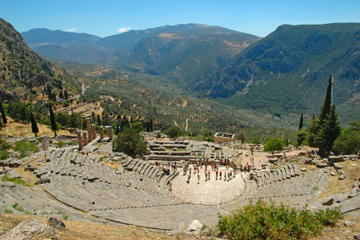 Delphi Day Trip: If you want to complement your Athens tour by exploring historic monuments further afield, consider the Delphi Day Trip. This full-day tour takes you to this World Heritage-listed archaeological site to see the Temple of Apollo and the Delphi Archeological Museum. On your way home, you have a chance to explore the picturesque towns of Arachova and Levadia. Included in the tour are hotel pickup and drop-off at select hotels, free Wi-Fi, and entrance fees. Mycenae and Epidaurus Day Trip: Stunning scenery and hilltop ruins are the highlights of the Mycenae and Epidaurus Day Trip. This full-day guided adventure includes a beautiful drive along the Saronic Gulf and into the Peloponnese to see the hilltop ruins of Mycenae as well as a visit to Epidaurus, the birthplace of Apollo's son, and the picturesque town of Nauplia. Also included are entrance fees, a professional guide, free Wi-Fi on the coach, and a map. Cape Sounion and Temple of Poseidon Day Trip: See one of Athens' most famous monuments on the Cape Sounion and Temple of Poseidon Half-Day Trip. Traveling in an air-conditioned coach, you can sit back, relax, and enjoy a scenic drive to Cape Sounion to see the remains of the clifftop Temple of Poseidon, overlooking the sea, while an experienced guide shares information about its history. This four-hour tour includes hotel pickup and drop-off at select hotels, entrance fees, and free Wi-Fi on the coach. The rich history of Greece extends far beyond Athens, but the remains of the Temple of Apollo in Corinth and the seat of the oracle at Delphi are within the reach of a day trip. In addition to numerous mainland attractions, like the monasteries above the rock formations at Metéora, the numerous Greek Islands are known for their iconic whitewashed houses with brightly painted shutters, ancient ruins, medieval monasteries, and varied landscapes. The romantic island of Santorini (also known as Thíra) is popular with couples and celebrities, famous for its bright houses that seem to cling to the side of the island's volcanic cliffs. The largest of the Greek Islands and southernmost part of Europe is Crete, which is large enough to occupy an entire vacation. Heraklion is the island's main port and capital city, best known for the Minoan Palace of Knossos. West of here, the town of Réthymnon has several interesting historic attractions, including Turkish mosques and Venetian churches. Farther west, the coastal city of Chania was founded by Minoans as the city-state of Kydonia nearly 5,000 years ago. North of Santorini, the island of Delos is a UNESCO-listed site, known in mythology as Apollo's birthplace. Heraion (the Temple of Hera) is also a UNESCO site, sitting on the far-reaching island of Sámos, which is less than two kilometers from the coast of Turkey. The port city of Rhodes Town is also heavily influenced by surrounding cultures, and is a popular cruise stop. The best beaches in Greece can be found on Corfu Island; its capital city Corfu Town is a pedestrian-only vacation paradise with Mediterranean charm.